Disney’s Saving Mr. Banks landed at theaters in wide release on December 20th and if you haven’t yet seen this remarkable film, definitely make your way to the theater soon. The movie details the real-life story of how Walt Disney courted author P.L. 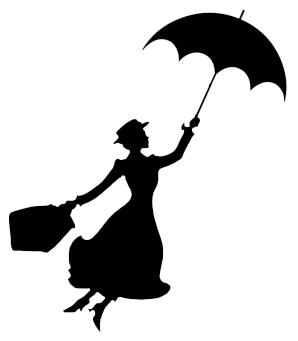 Travers to allow him to option the rights to her book, Mary Poppins, for a silver screen adaptation. 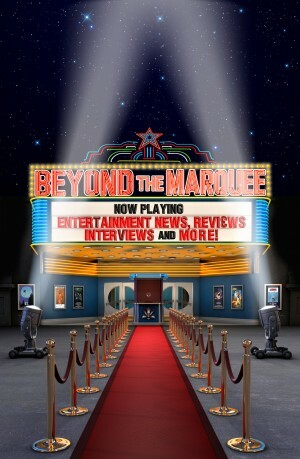 One of the remarkable aspects of the film is that the filmmakers were able to utilize many filming locations where the actual events of the story took place – namely The Walt Disney Studios in Burbank, California in addition to several other locations throughout Southern California. 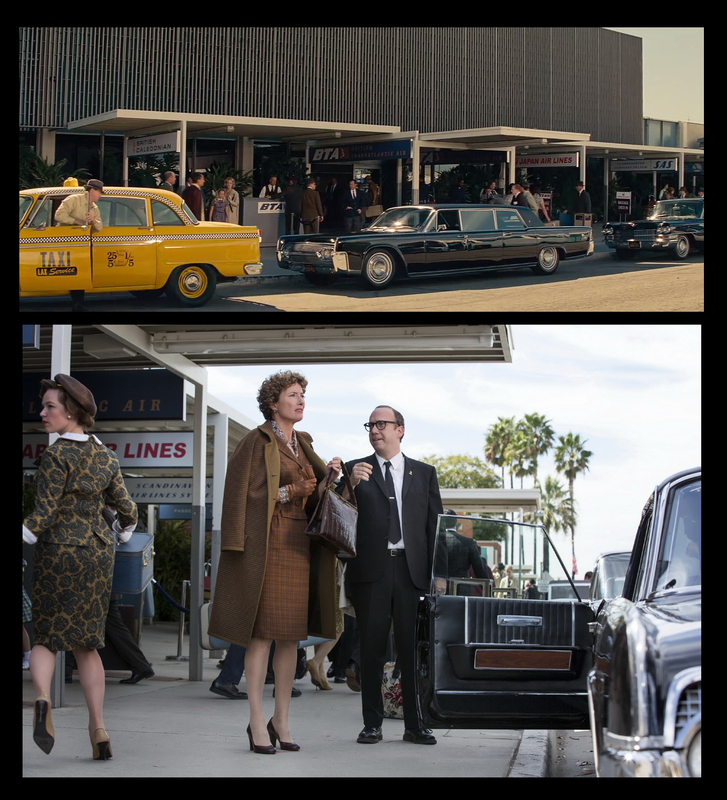 What follows is a comprehensive look at the locations the filmmakers used to bring Saving Mr. Banks to life. In order to visually recreate many aspects of the movie’s 1961 era, the Saving Mr. Banks production team was provided with full access to the Disney Photo Library collection in which more than 500 photographs were examined. 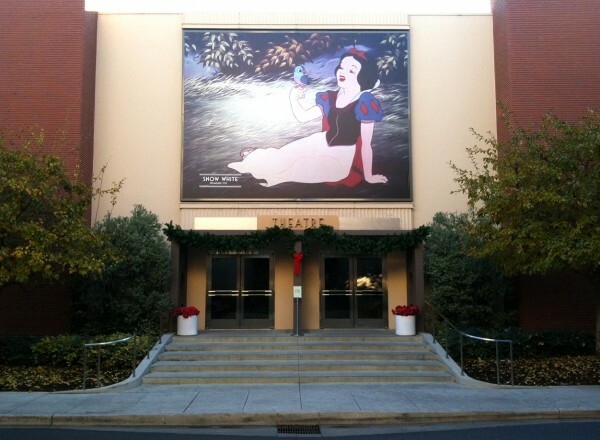 In addition, the Walt Disney Archives were on hand seven days a week to answer any questions that might come up about minute details concerning Walt Disney, the Studio and Disneyland. The end result is a faithful recreation of that time during the development of Mary Poppins – one of the last of several crowning achievements in Walt Disney’s career. Feel free to click on the pictures for a better look and they’ll open in a new window. Now grab your umbrella and let’s take off on the tour! Aside from one day of filming in London, the entirety of Saving Mr. Banks was filmed in Southern California. 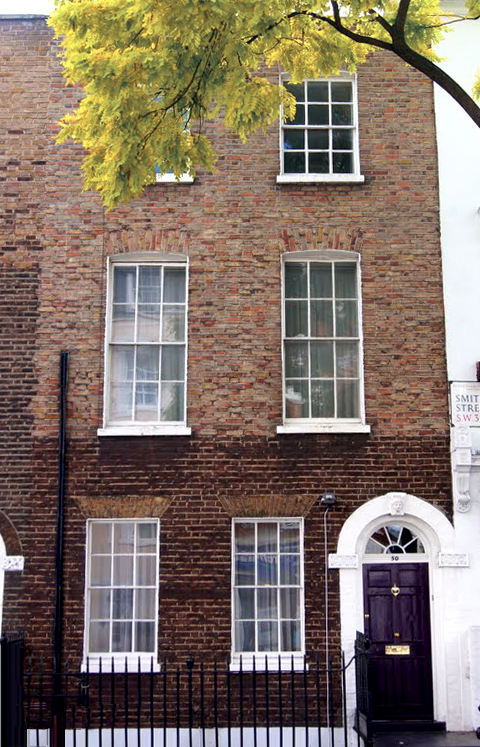 The only filming done in London was an establishing shot of the actual exterior of P.L. Travers’ home at 50 Smith Street in Chelsea. The interiors of her home, however, were stage sets built at the Santa Clarita Studios in California. P.L. Travers’ office set on display at the Walt Disney Studios. 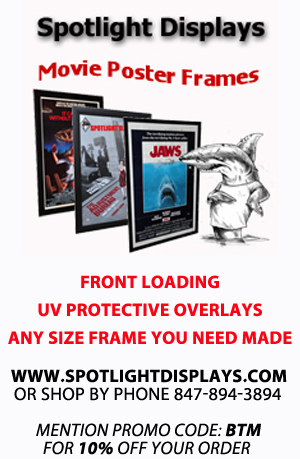 Interwoven between the ‘modern day’ events in Burbank, California in 1961, the film often flashbacked to P.L. Travers’ childhood in Australia, circa 1906, where she grew up. Despite casting and research trips to Australia, Director John Lee Hancock and the production team didn’t do any filming in that country. 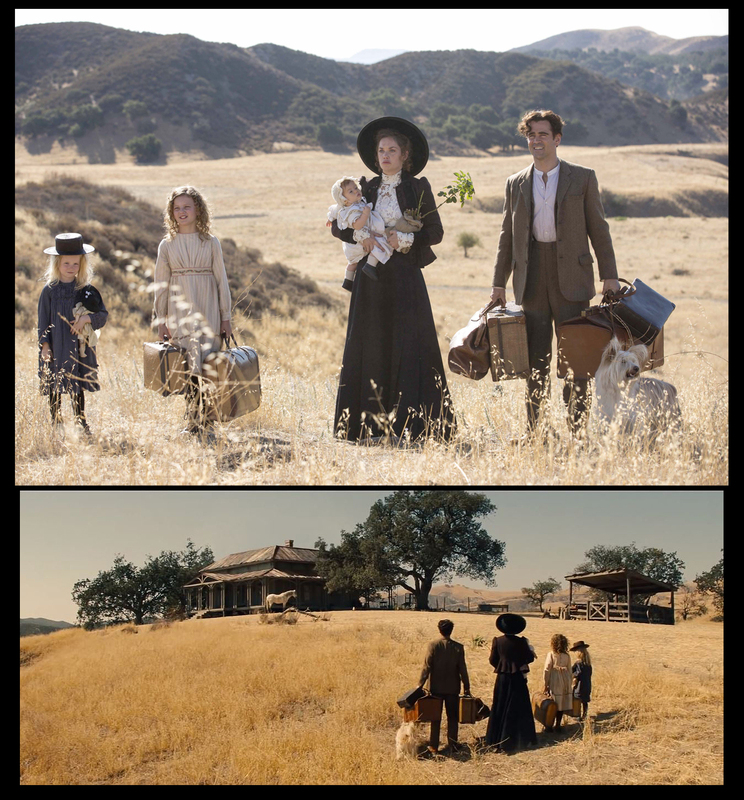 Locations throughout Southern California were used for the Australian landscape and the substitution was quite effective. To simulate the vast rolling hills of the Australian countryside, veteran location manager, Andrew Ullman, located sites at the Big Sky Movie Ranch in Simi Valley, California. The filmmakers built the set for the Goff’s house and the carnival fairgrounds which included a rented carousel from a prop house. The Big Sky Ranch is one of the oldest and largest movie ranches just outside of Los Angeles that is still in use today. It has been used for countless productions including feature films, television series and music videos and was the main location for “Little House on the Prairie” and could also be seen in “Bonanza”. The first Transformers movie filmed a scene there and the ranch had already been used once before as the Australian Outback for the celebrated “Thorn Birds” mini-series in the 1980’s. Unfortunately, unless you’re working on a film or TV production, you cannot access this property for a visit. A pivotal scene in the film takes place at the bank where Mr. Goff (Colin Farrell) works located in the quaint town of Allora. 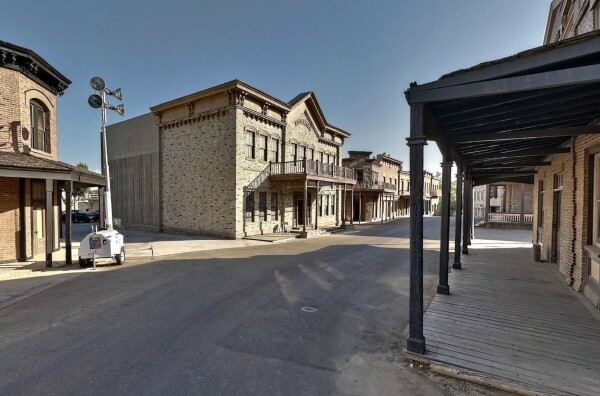 The bank and town were all filmed at the famed Universal Studios backlot on their Western Street set. P.L. Travers’ 1961 arrival in Los Angeles is definitely a scene to remember as her first impression of the city is summed up as a smell not unlike “chlorine and sweat.” Her arrival and pickup by Disney Studios driver, Ralph (a character invented for the film), took place at the old terminal at the Ontario, CA International Airport. You might have seen this location before as it has been used in several retro productions including Steven Spielberg’s, Catch Me If You Can, and most recently, Ben Affleck’s, Argo and TV’s short-lived, “Pan Am”. 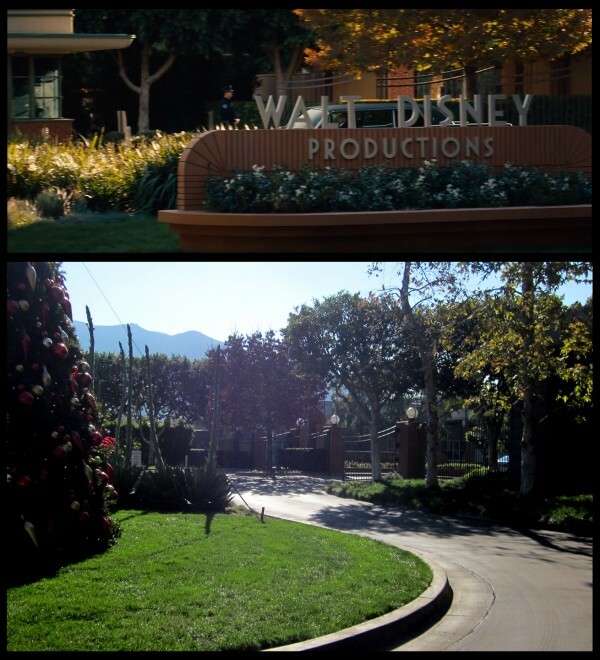 The majority of the film takes place at The Walt Disney Studios in Burbank, California. The historic lot was built in 1940 when Walt Disney needed to expand operations from his original cartoon studio located on Hyperion Avenue in Los Angeles. It was the profit money from Snow White, (approximately 8 million dollars), that allowed Walt to purchase the roughly 50 acres in Burbank to build his new studio. 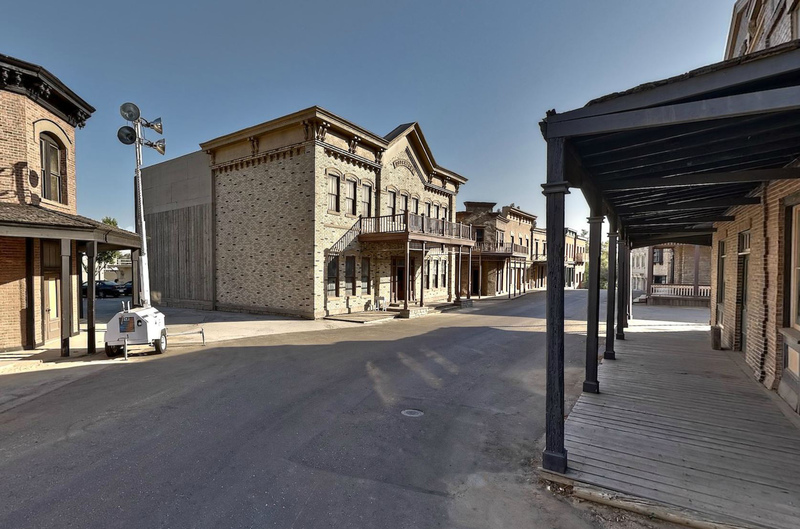 The old Shorts Building, constructed from the original Animation Buildings at Hyperion, in addition to a bunglaow used by Disney Publicity and the Mickey Mouse Comic Strip Department, were moved from the Hyperion lot and are still in existence today on the Burbank lot. Despite some new buildings being built up and others torn down throughout the history of the lot (sadly including demolishing all the original backlot sets filled with years of Disney history), the Walt Disney Studios retain much of their college campus charm that Walt so carefully planned. The Hyperion Bungalow as it looks on the Burbank lot today. The Saving Mr. Banks production team spent several days filming on the studio lot and it was not uncommon for studio workers to get a glimpse of Walt reincarnated in the form of Tom Hanks. People calling out to Tom would typically get a response from Hanks saying, “Call me Walt.” No doubt, this was a very tongue-in-cheek comment from Hanks that harkened back to stories of Walt Disney continually reminding his friends, co-workers and others that they call him “Walt” (which was also included as a scene in the film). The movie shows P.L. Travers’ limousine pulling in to The Walt Disney Studios main gate. The main gate is still there along with a decorative brick-work sign out front on Buena Vista Avenue. The Saving Mr. Banks team added a second Walt Disney Productions brickwork sign which is no longer seen on the lot today. That area is occupied by a roundabout filled with cactus and shrubbery and also in December, the studio lot Christmas tree. The main gate as seen in the film circa 1961 and as it looks today. The scene where P.L. Travers first meets Mary Poppins screenwriter Don DaGradi & the Sherman Brothers was shot outside of Stage A, opposite the Studio Commissary. Situated next to the Main Theater on the lot, Stage A was originally used for scoring and for many years, the music for innumerable Disney movies and cartoons was recorded within. During the time that P.L. Travers was visiting, Babes in Toyland was being scored and this is notably seen in signage on the doors in Saving Mr. Banks. In 1985, the stage was converted to a dubbing stage and theater and is now an all-digital, state-of-the-art dubbing facility. 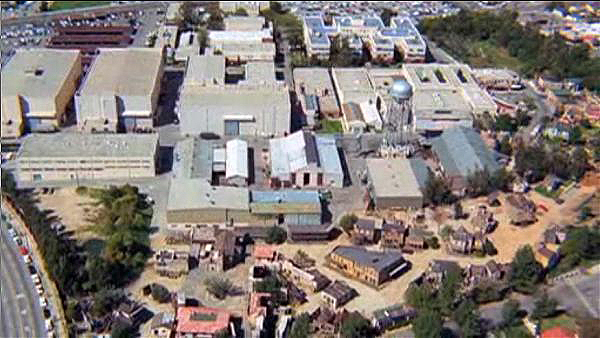 The Studio Commissary, seen briefly in the background, was constructed when the lot was built because there were no restaurants in close proximity at the time. Chili was one of Walt Disney’s favorite foods and to this day, the dish is still available in the Commissary. 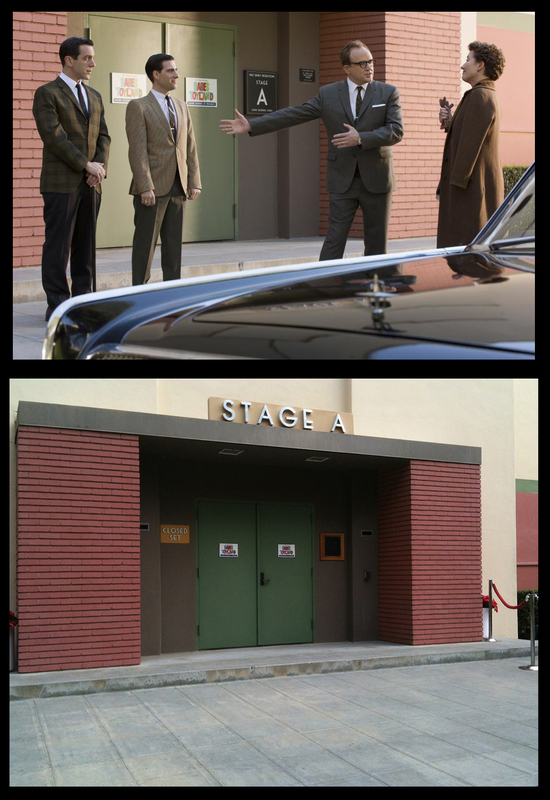 Stage A as seen in the film and in December, partly redressed for a ‘Saving Mr. Banks’ event. The Studio Commissary. Not much has changed since it was first built in 1940. The scene where P.L. 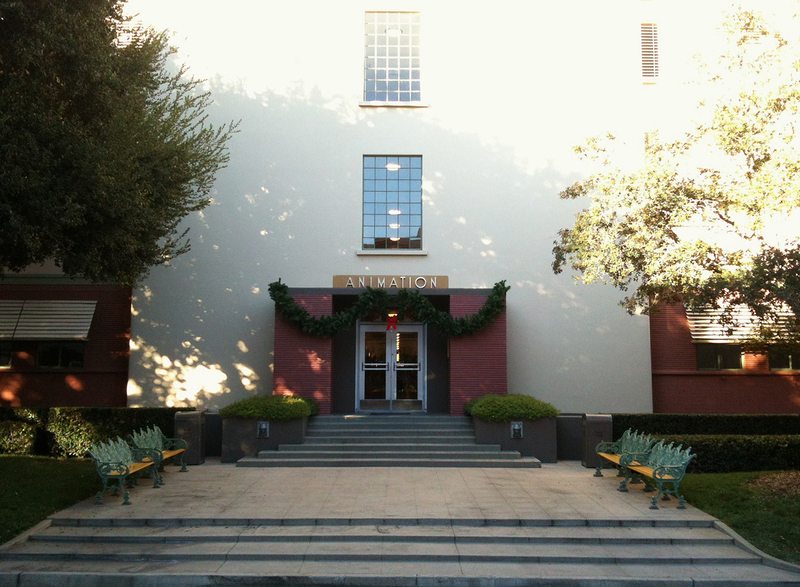 Travers and the Sherman Brothers pull up to the Animation building in a golf cart was filmed outside the southern entrance of the Animation Building across from the studio theatre. The fixture of the studio lot, the original ‘old’ Animation Building, still stands today and now serves as a home for many production companies and studio departments. The exterior is virtually unchanged and a walk around the building is about as close to time travel to Walt’s era as you can get. Inside, it’s a bit of a different story. The last animated feature produced in the building was 1986’s The Great Mouse Detective, and since that time, many of the offices have been renovated into more modern office spaces. The animators were moved to a nondescript warehouse in Glendale for several years before finally being moved into the Roy E. Disney Animation Building across from the main lot in Burbank (interestingly enough, on a parcel of land that Walt considered for Mickey Mouse Park, a pre-cursor idea to what eventually became his grander-designed, Disneyland). 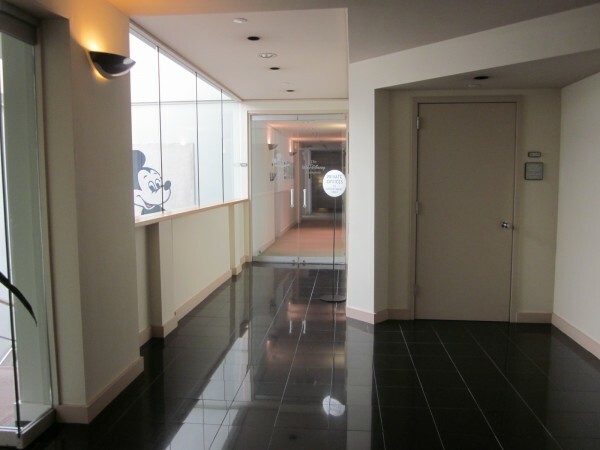 Walt Disney’s original office was located on the third floor of the old Animation Building (he had a formal and working office in tandem to each other) and retains some of its old features, but for the most part it is unrecognizable from how it looked during Walt’s time. After Walt died in 1966 (only two years after the release of Mary Poppins) the office was pretty much locked up for several years until archivist Dave Smith was hired in 1970 … one of his first tasks being to document the entire office as Walt left it. His detailed notes have formed the basis for several exhibits throughout the years that have put Walt’s office on display at Disneyland and Walt Disney World. The office is currently on display in the traveling exhibit, “Treasures of the Walt Disney Archives” which started out at the Ronald Reagan Presidential Museum in Simi Valley, CA and is now located at The Museum of Science and Industry in Chicago thru May 4th, 2014. 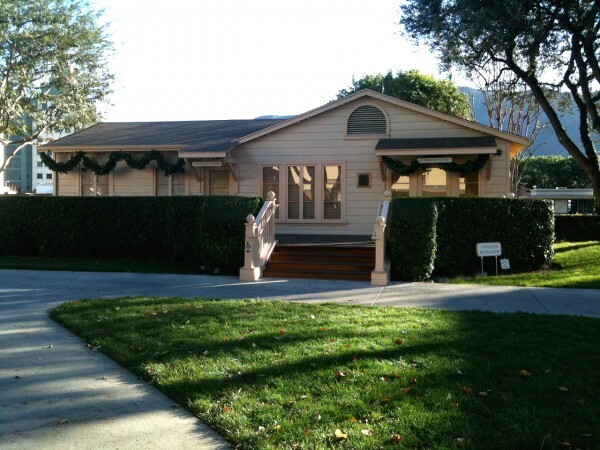 The only way to get a look at Walt’s office as it exists today is by knowing writer/producer Marc Cherry (“Desperate Housewives”) who currently resides in that office space and does not allow tours. Prior to Cherry, Shaun Cassidy occupied the space and often let people wander in for a look. He even had a wall devoted to old photos of Walt in the office as Shaun felt the place should be preserved as a museum. The modern day entrance to Walt Disney’s office. 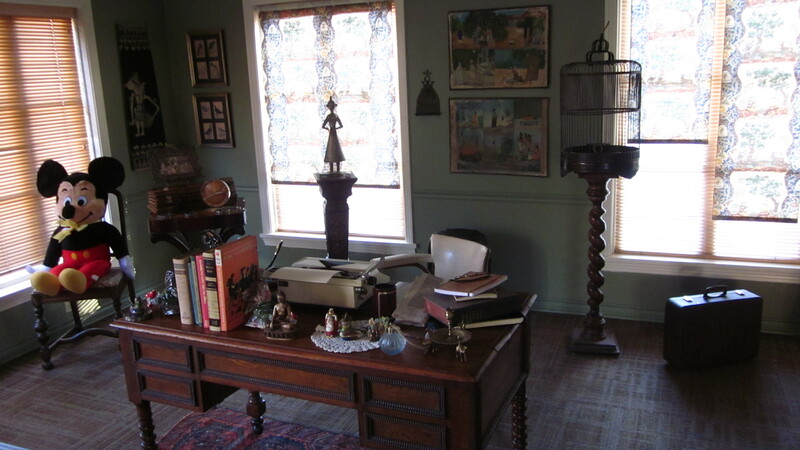 Since the filmmakers were barred access to visiting and using Walt’s actual office, they studied detailed photos of the original and were allowed to walk around and photograph the furnishings that were on display at the Ronald Reagan Presidential Library exhibit. The art department team measured and photographed original objects and furniture pieces for reproduction, including Walt Disney’s desk, side tables and shelf units. The Disney Archives staff even provided era-appropriate signage from the old Animation Building, which the art department referenced when recreating the building hallways … even replicating the metal and glass doors, which can still be seen in the building today. In fact, some of Walt Disney’s Academy Awards were loaned to the filmmakers from the display at Walt Disney World to adorn the set of Walt’s office. 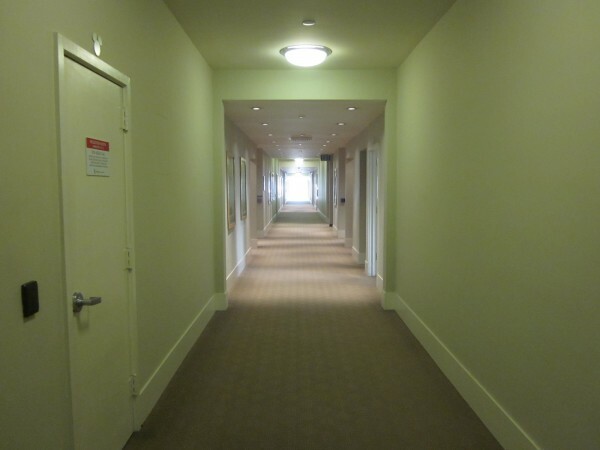 Walt’s hallway, receptionist area and office were all recreated at the Santa Clarita studios and gave the filmmakers much more flexibility in filming throughout the duration of the production. 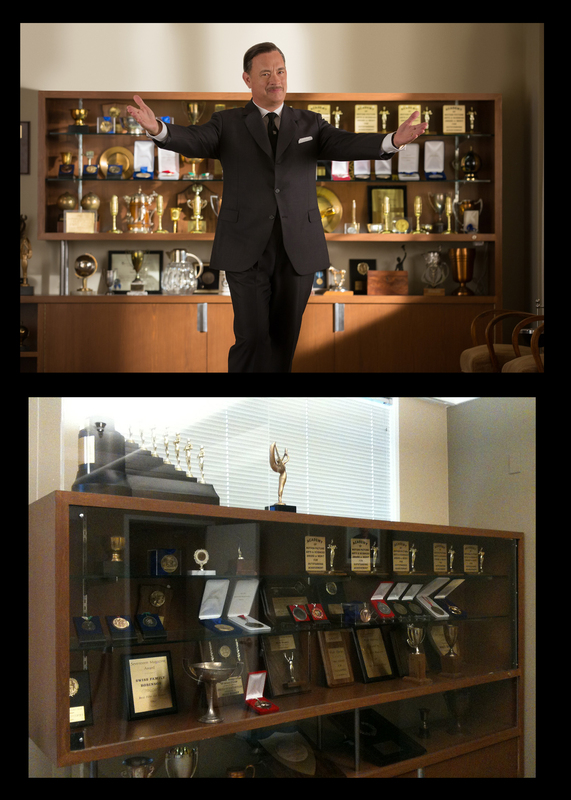 (Top) Tom Hanks appears as Walt Disney in front of his impressive awards cabinet. (Bottom) The prop cabinet and awards on display at the Walt Disney Studios. 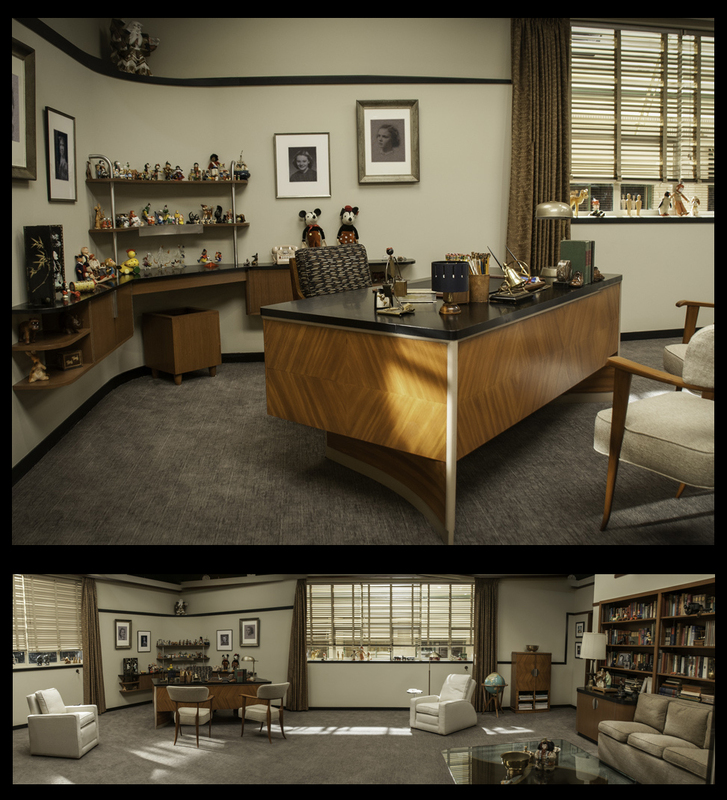 Walt Disney’s office as recreated on a set at Santa Clarita Studios. One area where the filmmakers took some creative license was with the music rehearsal room where much of the interaction between P.L. Travers and the Sherman Brothers takes place. In actuality, it was not a real room at the studio. For Saving Mr. Banks, the room was created as an amalgamation of the actual Sherman Brothers office on the third floor and other various rooms in the Animation building. Remnants of Walt’s era still exist inside the old Animation Building and you can enjoy a walk up the chrome-railed stairways, stand under the gold-leif rotunda on the main floor, spot the original domed light fixtures, sit in Walt’s old screening room and take in an impressive look at the studio theater from the second and third floor hallway windows. Those are just some of the treasures that are still to be found for those Disneyphiles who have the liberty to walk around and explore the amazing history of the building. The Sherman Bros. rehearsal room as seen in ‘Saving Mr. Banks’. The third floor window where P.L. 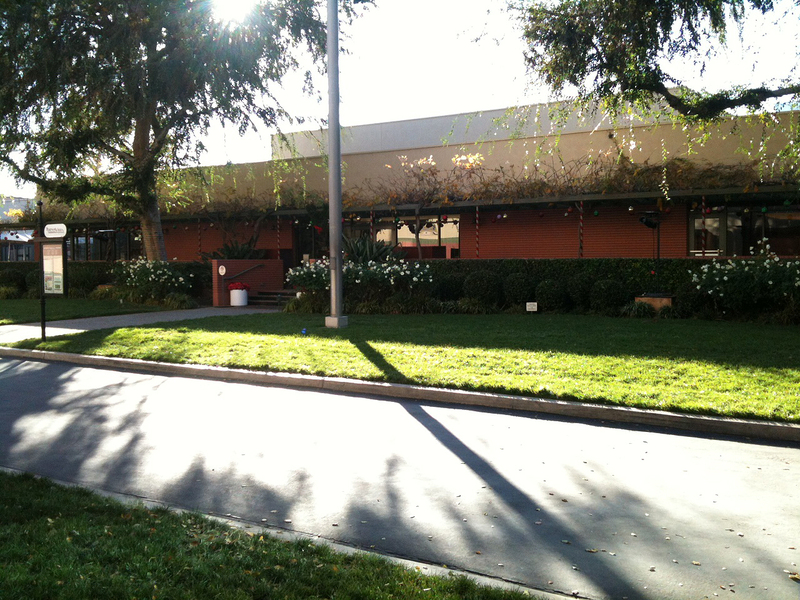 Travers (Thompson) throws the script out – located off the eastern D wing of the old Animation Building. 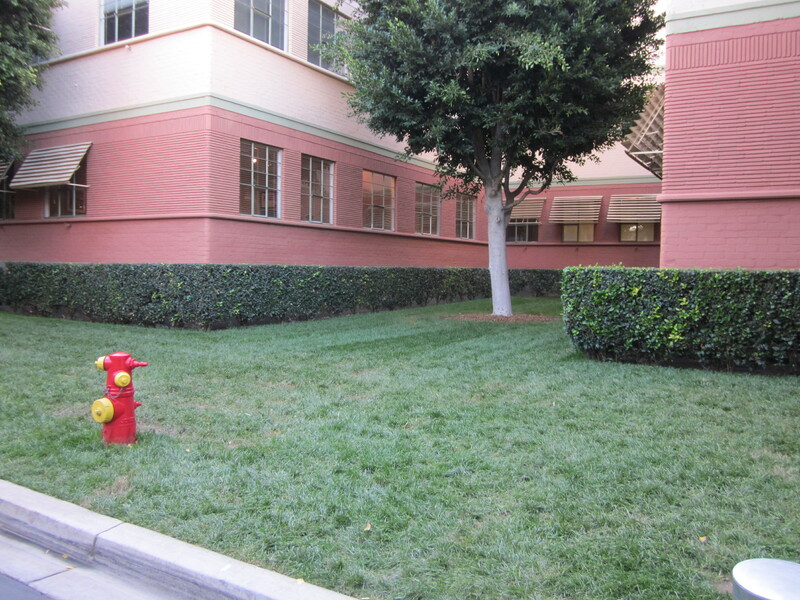 A touching scene between Ralph (Paul Giamatti) and Pamela (Emma Thompson) was shot just outside the old Animation Building where Emma Thompson sits in the grass and digs a trench on the east side between the last two wings (E & F), just below Walt’s old office. The tree is still easy to locate, but the trench no longer remains. An evening scene where Walt hears music emanating from above was shot on a bench just outside the front southern portion of the Animation Building. Coincidentally, Tom Hanks used to have an office in the Animation Building back in the late 1980’s. Approximately one year and a month after filming the scenes on the lot, Tom Hanks and the cast returned for the Saving Mr. Banks premiere and sang “Let’s Go Fly a Kite” while taking a group photo on the steps of the old Animation Building. Emma Thompson and Paul Giamatti build a trench near this tree just below Walt’s real office. The cast of ‘Saving Mr. Banks’ on the steps of the old Animation Building at the film’s premiere. For those wanting a tour of The Walt Disney Studios, opportunities are few and far between unless you work on the lot or can secure a private tour. The studio officially does not offer tours to the public like other studios in the area, namely Universal and Warner Bros. Periodically, the Disney D23 fan club will offer opportunities to take tours on the lot and if you’re a member and can afford the trip, the experience is well worth it. Whether you’re a die-hard Disney fan or just someone with an appreciation of Disney’s history, a visit to the studio lot is very memorable indeed. In early November of 2012, the Saving Mr. Banks production spent two mornings (and an afternoon) filming at Disneyland in Anaheim. The scenes that were shot were of Walt Disney taking P.L. Travers on a personal tour of Disneyland in an attempt to soften some of her rougher edges during the development of the Mary Poppins script. 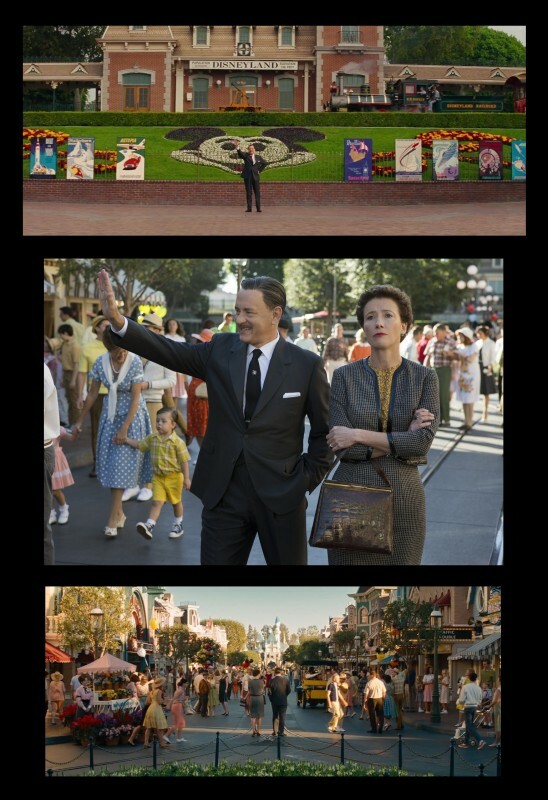 Saving Mr. Banks was only the third feature film to ever shoot scenes at Disneyland. Coincidentally, the last feature to film at the park was Tom Hanks’ directorial debut, That Thing You Do, in 1996. 40 Pounds of Trouble (1962) was the only other film that managed to shoot in the park before. Filming took place at the Disneyland entrance and Main Street in the early morning hours (to beat the crowds at the park’s 10am opening time). 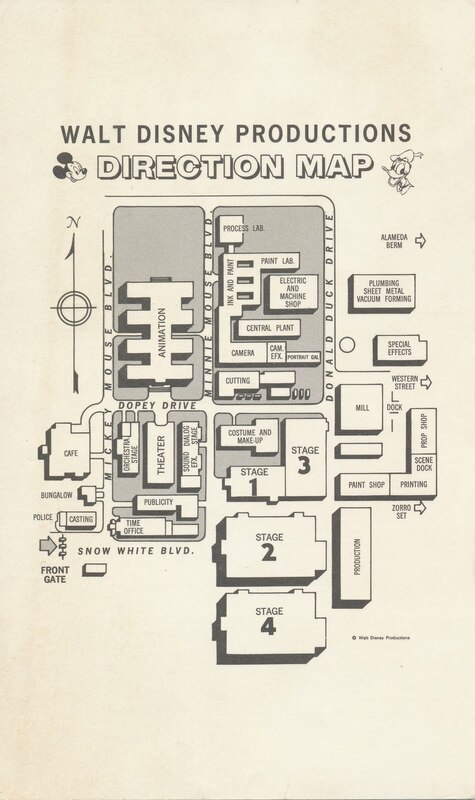 In 1961, Disneyland’s entrance was situated opposite an enormous parking lot and the scene where P.L. Travers’ limousine pulls right into the entrance was not unfeasible at the time. Today, that can still be accomplished, but the original parking lot is long gone and now the home of Disney’s California Adventure park, built in 2001, along with a sprawling entrance plaza between the two parks. Inside the park, Fantasyland was closed down for one afternoon to film just behind Sleeping Beauty’s Castle for a key scene on King Arthur’s Carousel. 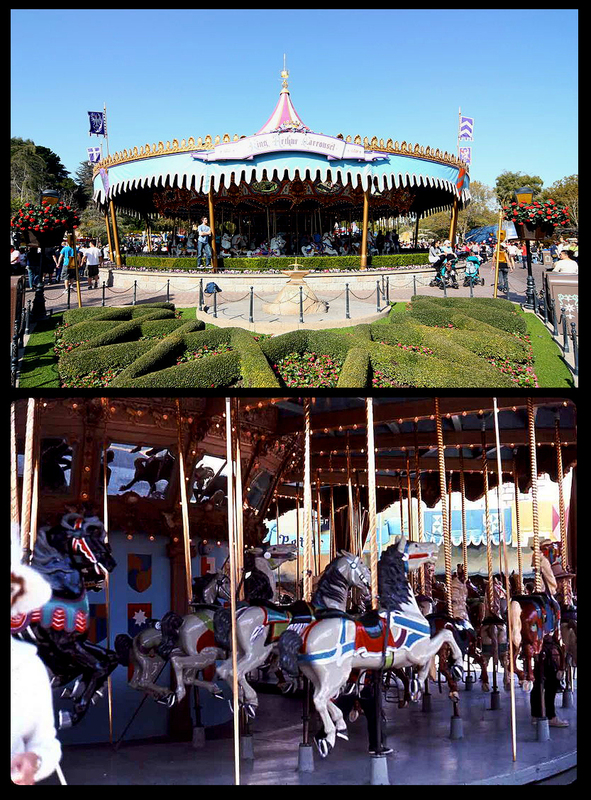 King Arthur’s Carrousel is one of the original rides from Disneyland’s opening in 1955 and was inspired by the carrousel at Los Angeles’ Griffith Park where Walt Disney first thought up the idea for Disneyland. The horse that Emma Thompson rides in the film is named “Jingles” and is the lead horse. It was Lillian Disney’s favorite and was named ‘Jingles’ for its very ornate carvings which include straps of jingle bells hanging from her saddle and cantle. The horse’s connection to Mary Poppins was fully established in 2008 when it was dedicated to Julie Andrews when she was named as Disneyland’s Honorary Ambassador. In 1961, the horses were not all painted white despite what is seen in Saving Mr. Banks. Originally, the horses on the carrousel were brown, gray and black with only the lead, Jingles, being white. The lead horse became so popular that in 1975, all the horses were painted white and have remained like that since, even through several refurbishments. To give Saving Mr. Banks some authenticity despite all the horses being white for filming, Jingles was returned to her archival colors. King Arthur’s Carrousel today and an image of the multi-colored horses in 1964. Emma Thompson is placed upon ‘Jingles’, the lead horse and a favorite of Mrs. Disney’s. The penultimate scene of Saving Mr. Banks centers around the 1964 premiere of Mary Poppins at the famed Grauman’s Chinese Theatre in Hollywood (recently renamed the dreadful, “TCL Chinese Theatre”). The production crew recreated the events of the premiere evening by filming in the theatre’s forecourt and interior. The forecourt of the theatre is most notable for its many handprints and footprints of celebrities, producers and directors from the earliest days of Hollywood. During the time of the premiere of Mary Poppins, the theatre had an ornate canopy that covered the red carpet from the sidewalk to the entrance of the building. 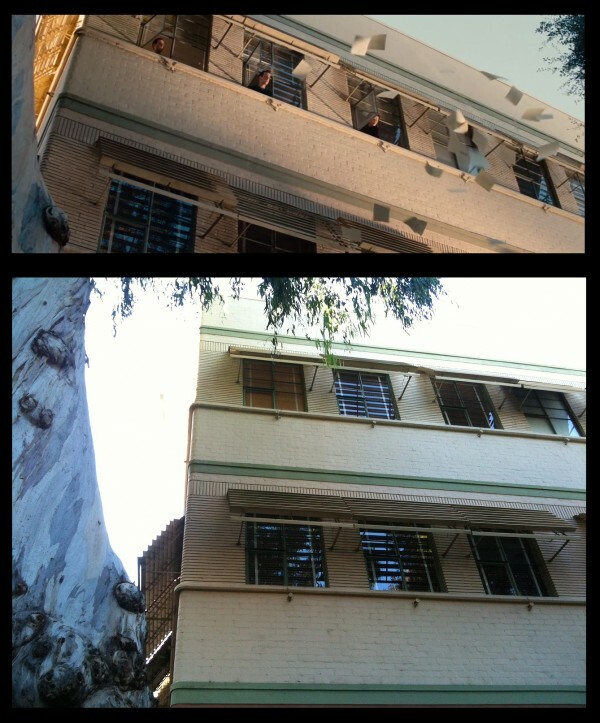 Due to deterioration, it and several other pieces of ornamentation from the building have simply been removed rather than replaced. For Saving Mr. Banks, the filmmakers opted to replace the missing canopy with cherry blossom trees similar to what was used on the set of Mary Poppins. Today, the Chinese theater ranks as the largest (seating) capacity IMAX theatre in the world. During a recent refurbishment, the auditorium’s decorative walls were left unaltered, the existing curtain was extended, decorative lighting effects were added along with TCL digital signage and seating was vastly improved to accommodate the new IMAX screen. 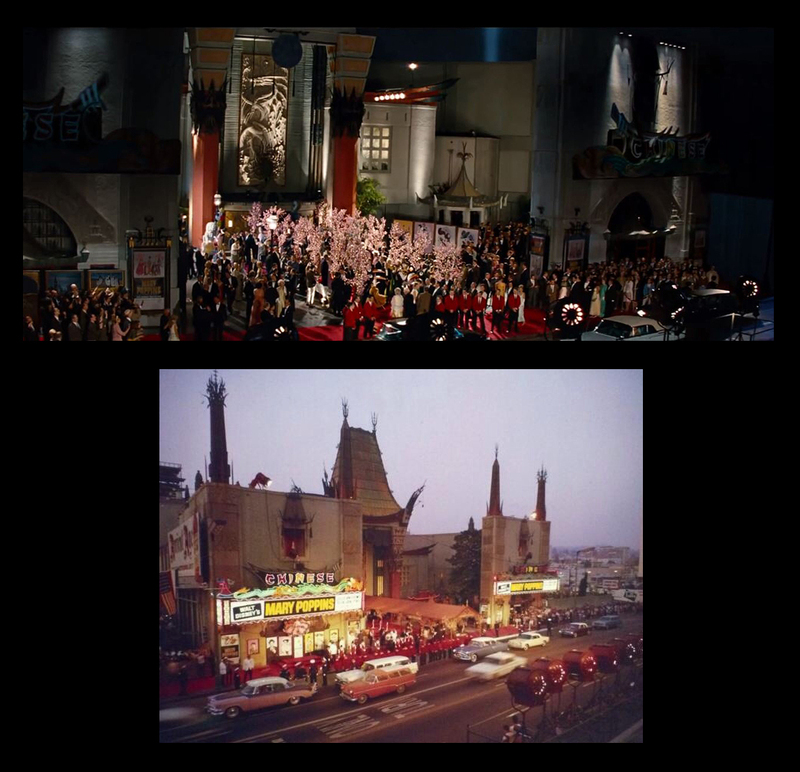 A look at the theatre in ‘Saving Mr. Banks and how it actually looked on the night of the 1964 ‘Mary Poppins’ premiere. 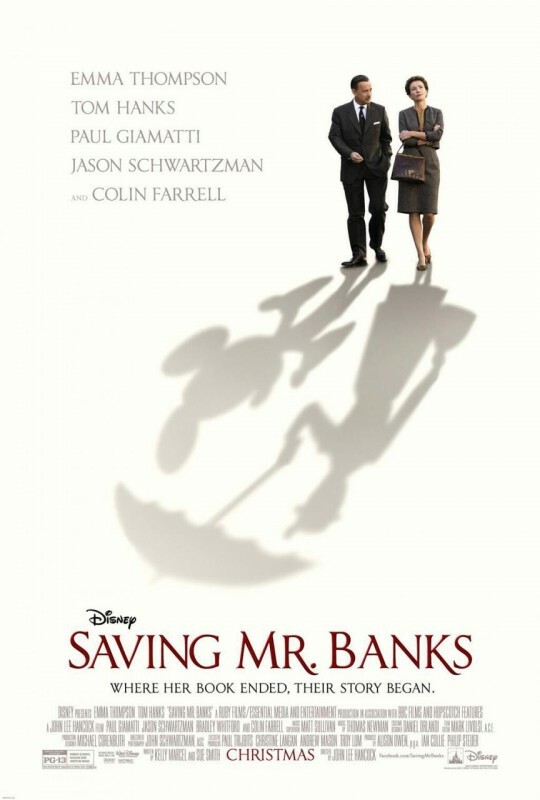 Saving Mr. Banks is the first feature-length, theatrical drama to depict Walt Disney. The combination of Tom Hanks’ performance in addition to the stellar cast and attention to accurate detail by the filmmakers is a sight to behold. The film steers very close to the actual events that took place and presents a unique look at Walt Disney, his studio and the fascinating development of the classic film, Mary Poppins. For those wanting to get a more intimate understanding of Saving Mr. Banks and the process behind its creation, do your research and head on out to some of the real-life locations if you can. It’s more fun than flying a kite! Special thanks to Rebecca Cline and the Walt Disney Studios Archives and Walt Disney Studios Motion Pictures Special Events. 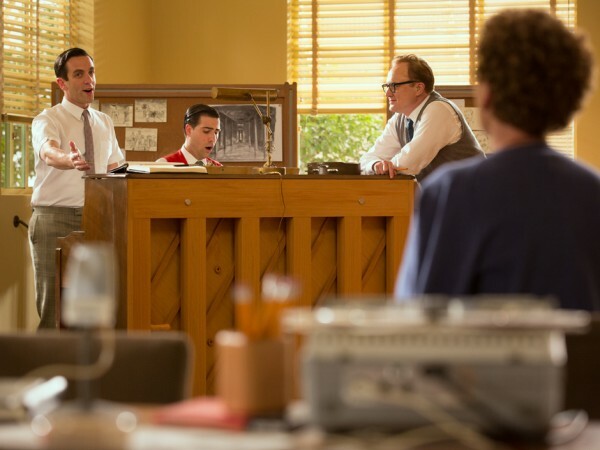 All production stills for ‘Saving Mr. Banks’ – Copyright Walt Disney Pictures, 2013. 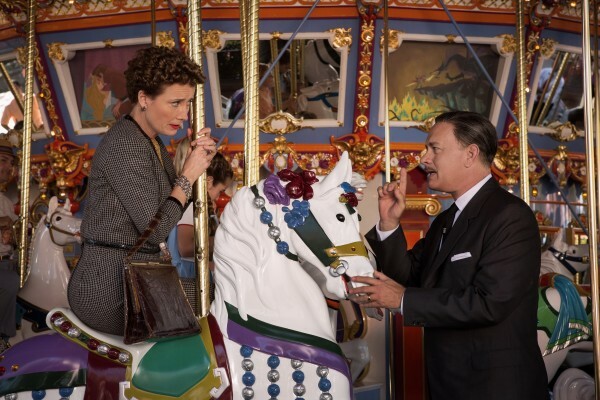 Two-time Academy Award®–winner Emma Thompson and fellow double Oscar®-winner Tom Hanks topline Disney’s Saving Mr. Banks, inspired by the extraordinary, untold backstory of how Walt Disney’s classic, Mary Poppins, made it to the screen. When Walt Disney’s daughters begged him to make a movie of their favorite book, P.L. Travers’ “Mary Poppins,” he made them a promise—one that he didn’t realize would take 20 years to keep. In his quest to obtain the rights, Walt comes up against a curmudgeonly, uncompromising writer who has absolutely no intention of letting her beloved magical nanny get mauled by the Hollywood machine. But, as the books stop selling and money grows short, Travers reluctantly agrees to go to Los Angeles to hear Disney’s plans for the adaptation. For those two short weeks in 1961, Walt Disney pulls out all the stops. Armed with imaginative storyboards and chirpy songs from the talented Sherman brothers, Walt launches an all-out onslaught on P.L. Travers, but the prickly author doesn’t budge. He soon begins to watch helplessly as Travers becomes increasingly immovable and the rights begin to move further away from his grasp. It is only when he reaches into his own childhood that Walt discovers the truth about the ghosts that haunt her, and together they set Mary Poppins free to ultimately make one of the most endearing films in cinematic history. Inspired by true events, Saving Mr. Banks is the extraordinary story of how Mary Poppins made it to the screen—and the testy relationship that the legendary Walt Disney had with author P.L. Travers that almost derailed it. 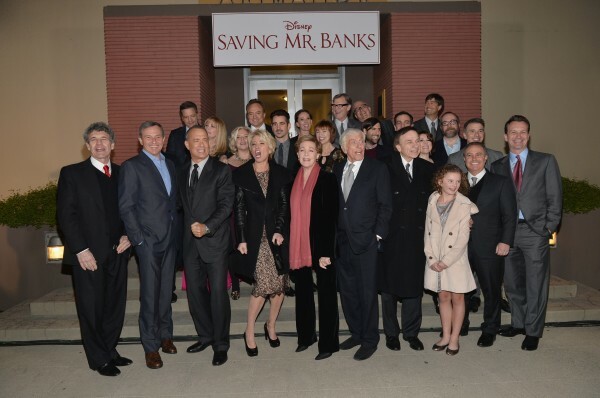 Saving Mr. Banks is directed by John Lee Hancock, produced by Alison Owen, Ian Collie and Philip Steuer, and written by Kelly Marcel and Sue Smith. 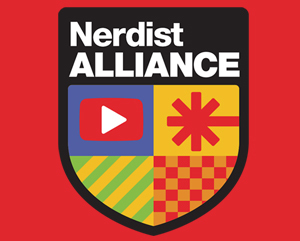 Executive producers are Paul Trijbits, Christine Langan, Andrew Mason and Troy Lum. 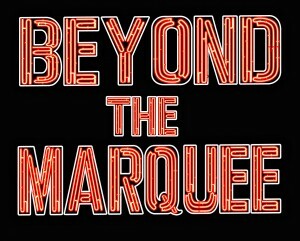 Exclusive to Beyond the Marquee, LOCATION, LOCATION, Location?is a popular recurring feature that chooses random filming locations from some famous (and not so famous) film and television productions throughout the years. 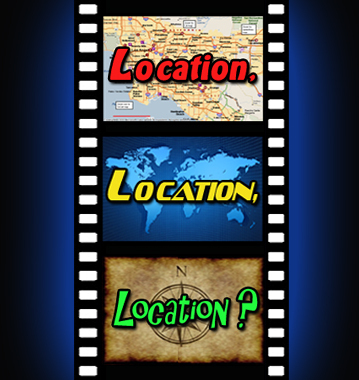 The locations are posted for BTM viewers to take a guess as to what movie or TV show the location was used. The goal is not to point out exact address information for these locations, but to encourage viewers to put on their own marquee’ologist hats and experience the thrill of the hunt to discover and visit these real world settings themselves.